We all have days we're scared. When we just feel worthless. You already know this, because you've had them too. But one of the things that helps getting past them is the reminder that you're not alone in the feeling, and that it's normal sometimes. My readers tell me they enjoy my book. Yet sometimes, yes, I wake up thinking it's a polite lie, and someone is going to catch me trying to be an author and fire me from authoring (because that can happen, right?). And then, just because, my dayjob will fire me, too. Those are the cold, dreary, irrational days that get me down, when I think from one end of the day to the other that I'm an imposter and a failure. But that's normal. Everyone has days like those. Mine? They happen when I don't sleep enough--pretty consistently connected, in fact, which is one reason I try to get enough sleep. It's been a rather insomniatic week for me, so needless to say I haven't been at my best. At least in my case, I know the feelings will probably pass after I get a good night's rest. That really does help. 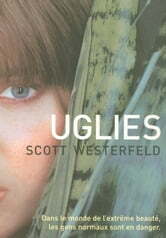 I went to a book signing for Scott Westerfeld last night, and I've been thinking that it's that feeling of perpetual awkwardness, that imposter syndrome, that made me really connect with Tally in his novel Uglies. Because we all feel ugly sometimes. Because Tally didn't consider herself someone special, but rather someone inadequate. And just when she does begin to feel special, it leads her to make mistakes, and causes her suffer through the loss of those she loves most. Yet she does some amazing things in the novel. She faces her fears and, despite winding up over her head, survives. Eventually, her journey forces people to face the ugliness of their beautiful city. She's no "look at me, I'm a special snowflake" sort of person; she pushes on despite feeling overwhelmed, inadequate, afraid. She loses some battles, some major battles. But she doesn't quit. It's reading characters like her that have given me the strength to get through the grey days. That's one of the secret superpowers of fantasy and scifi: they give us role models who teach us how to get through our own troubles. That's the power of characters with flaws, characters who struggle and fall apart. Because reading how they keep going, how they win--that's where I learned the courage to face my own struggles and insecurities. We all have days when we think we're not good enough. Days we think we'll never be good enough. And half the days we think we're awesome, we'll end up being knocked down a few pegs by our own mistakes. That's part of being human. But the characters we love have shown us how to get past our own dark sides. It's their real superpower, because despite being fiction, they can teach real people. And those of us who learn from them, who face our fears with lessons learned from fiction: that's a superpower, too. If you're a writer, don't be afraid to give your characters flaws. That's the greatest strength you can hand them. And if you're a reader, having a bad day and turning to stories to cheer you up: not all courage is about facing villains or monsters or bubbles of magic. Sometimes, the greatest battle is fighting your own doubts.